Linkit Smart 7688 Duo is yet another open source OpenWRT Linux-based Hardware Development Kit. It comes with inbuilt WiFi and is compatible with Arduino Yún sketches. Its platform is powered by Mediatek’s MT7688 [MPU] and Atmega32u4 [MCU]. The board provides a rich set of hardware interfaces including GPIO, UART, I2C and others, and connectivity through USB and Ethernet communication protocols. The board also comes with decent memory and storage. The hardware platform is compatible with Arduino IDE. Thus, the developers can hook up the sensors to the GPIOs and run the Arduino code to probe the sensor data. A UART bridge with MPU can be used push the data to the cloud. The peripheral options and inbuilt memory pack quite a punch for developers wanting to develop device applications even with processing-intensive applications such as video processing. Moreover, options for Python, Node and C/C++ provides enough flexibility in the selection of programming language for writing the device application. There are various tutorials available on the internet, and also well documented on the Mediatek Labs website to readily build any application in a short time. 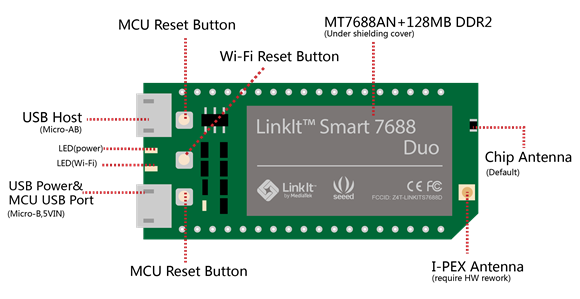 Linkit Smart 7688 Duo is for developers who work on small to medium complexity IoT / M2M use cases. It is ideally suited for those who want to start with single board computer with Linux and the ability to work with Arduino IDE, which is a boon for rapid prototyping. Although it lacks wireless PAN interfaces such as Bluetooth, if you only need WiFi/Ethernet connectivity to cloud, with decent processing punch, then this is a good choice. Another variant of the same board, Linkit Smart 7688 (without the Atmega32u4 MCU) is also available with a reduced interface set if your requirement suffices that. If you have built any interesting demos and prototypes using Linkit Smart 7688/7688 Duo then we would like to hear from you. Please share your experiences in comments. If you are thinking of building something, then get one, build some interesting stuff around it and see how it goes.